A wonderful friend recently posted the above picture on her Facebook page, and it brought back a flood of memories. Yeah, that's me on the far left. 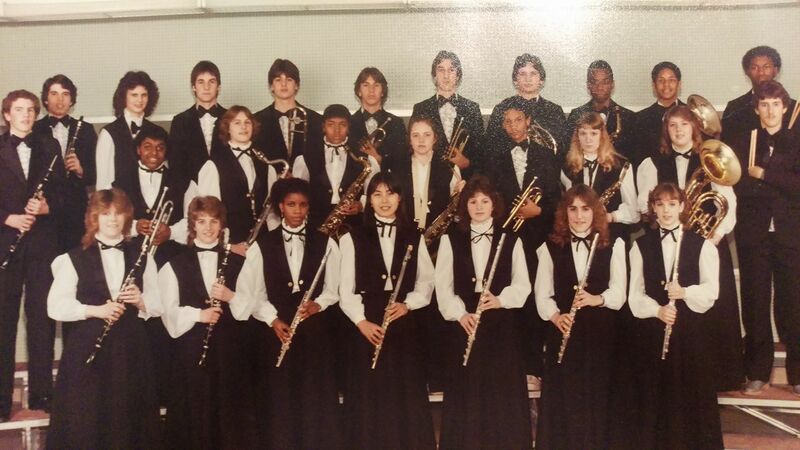 This is a picture of the Symphonic Band from my high school's yearbook from my freshman year. I played the clarinet. We were certainly children of the 80s. It was a great honor to be in the Symphonic Band. There weren't very many freshmen in this band. The Concert Band had most of the freshmen, and was, more or less, the "beginners band." The Symphonic Band contained the more experienced musicians. 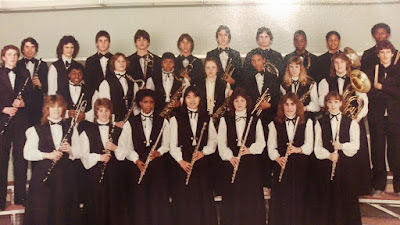 I remember, as an eighth grader in junior high, auditioning for the director of the high school band and being a nervous wreck, never guessing I could make the Symphonic Band. What I find most amazing about this picture is the fact that my daughter is the same age now as I was then, and she's following directly in my footsteps, though her poise and talent is so much more than I was. She recently auditioned for the high school band director, and found out she will be in the top band next year. She also plays the clarinet. I'm really excited for her, and she seems excited. I benefited from being in the band. It was an immediate social group for me, and made the transition from junior to senior high that much easier. Let's face it: being a freshman in high school is hard. You need any advantage you can get to establish one's social standing, and if you get to be a part of an established group that includes a cross-section of students from across the high school spectrum, then even better. Besides, band is fun.